The proper handling and transportation of fine art, antiques, and valuable furnishings is in itself an art. “White glove” handling involves far more than just the gloves to protect the art. 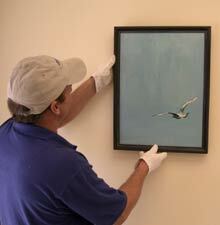 The art handling specialists must be knowledgeable of the arts media and construction so as to properly handle it. Our handling specialists also have a deep respect for the special meaning that the artist imparted to their work and the similar meaning and feelings of the owner. Proper handling requires time, patience, and care. Multiple handlers assure safety for the object being moved and the handlers. The correct equipment must be utilized so as not to place any object at risk. Proper packing and protective materials must be applied during transportation. Whether a small single painting or a large heavy glass sculpture, the same respect and cautious care must be applied. We are trained to assess the object being transported, the environment in which it will travel, and ultimately how it can best be displayed. Proper handling of art work, antiques and other valuables is far more complex than simple moving. The objective is perfection.